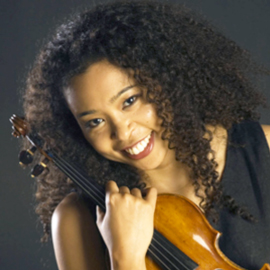 Violist NOKUTHULA NGWENYAMA came to international attention when she won the Primrose Competition and the Young Concert Artists International Auditions at age seventeen. Plaudits followed her debut recitals at the Kennedy Center (Washington, D.C.) and at the 92nd Street 'Y' (New York) and in 1998 she received the prestigious Avery Fisher Career Grant. A frequent presence on our series, Thula (as she is known), has most recently assumed the presidency of the American Viola Society. Born in California of Zimbabwean-Japanese parentage, Ms. Ngwenyama graduated from the Curtis Institute of Music. As a Fulbright scholar she attended the Conservatoire National Supérieur de Musique de Paris, and received a Master of Theological Studies degree from Harvard University.